We believe that all children should be given an equal opportunity to reach their full potential. Our goal is to protect children and teach them in a learning environment as they travel through their early year. We believe that play is the surest way for young children to learn, become self-confident and master hand-eye coordination. Smart From The Start Childcare currently has (2) different locations. Please choose the one closest to you. 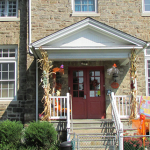 Smart from the Start Childcare in Chester Heights is housed in a beautifully renovated schoolhouse with large room sizes and an outdoor play area. The school is divided into three floors: Infants, Toddlers, and Preschool. Our school is housed in a 22,000 square-foot area with large interactive classrooms allowing your child plenty of space to engage in activities. We offer full and part time care as well as a Before and After School Program.